I make furniture all day, but I still gots no money; that doesn't explain my ad hoc infection, exactly. In construction and related disciplines, you're always making props and jigs and what-have-yous for the situation at hand, and you adopt it for a way of life after a while. People from the delicate arts (that don't want to admit they are) talk endlessly about duct tape because they think it makes them sound manly, but duct tape is more a symptom that you have no idea what to do than an indication you do, and are all manly and so forth. This stuff isn't a patch. Woodworking catalogs rely on people that don't ultimately make much buying expensive things with which to not make those things more easily. Parse that sentence, college boy. Anyway, here's a half-dozen examples of things I made that are better than things you can buy. 1. 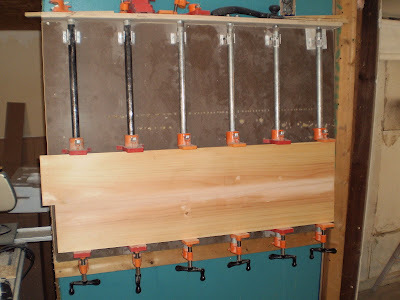 Clamping Jig - Clamps are really expensive. I'm awful if I ever see Norm making anything on that commendable show he had. Just ask my wife. 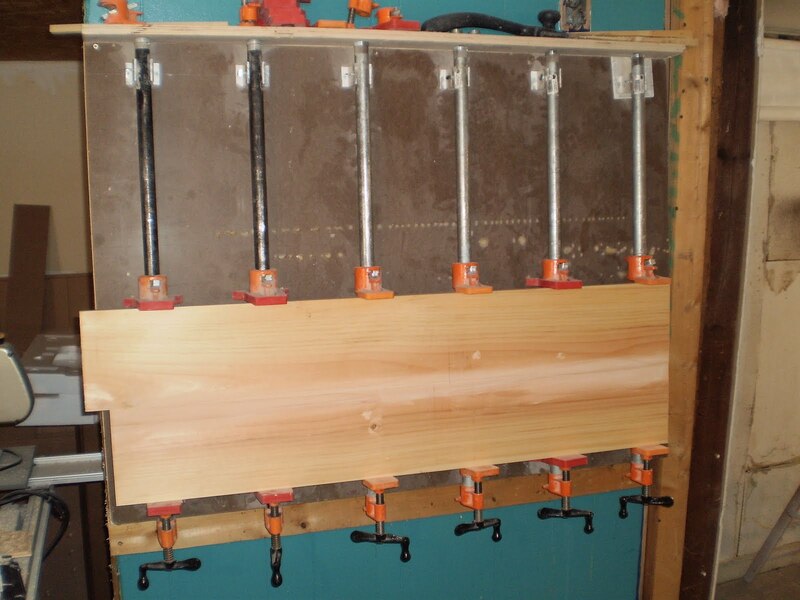 "He's making a four-dollar tabletop with four thousand dollars-worth of clamps!" She just nods and smiles. This is why we don't have cable. Here's how I make glue-ups. Iron pipe with pony clamps and pads, with the whole shebang hung on the wall to save space and my back. The galvanized pipes on the right don't leave marks on anything delicate like the black iron pipes on the left do. They should all be galvanized, but I'm cheap. 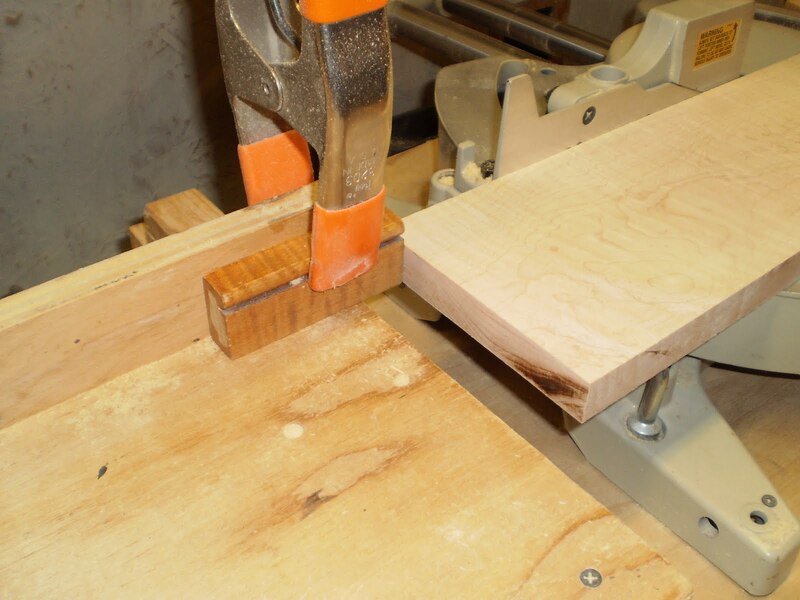 BTW, that benchtop blank in the clamps will be on sale by Friday. 3. Featherboards - Here's one of eleventy-jillion I've made. 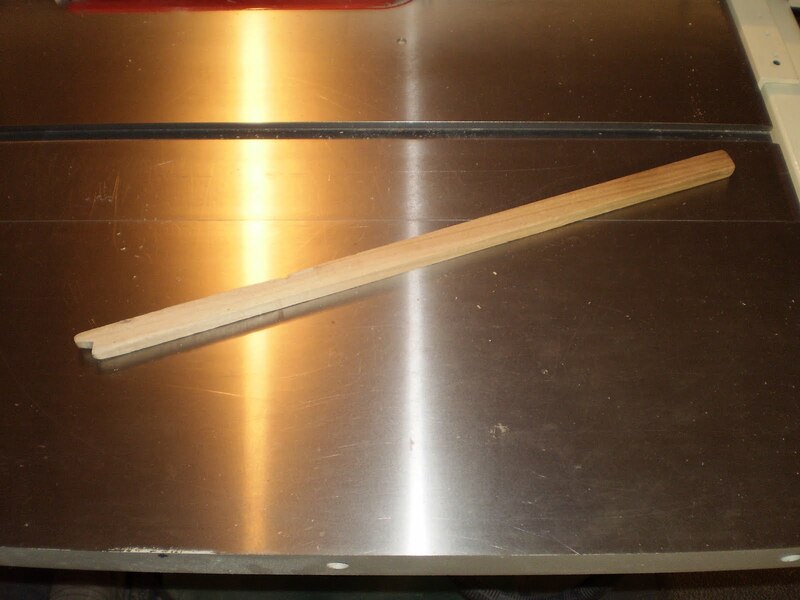 A piece of wood will go forward through a featherboard's little wooden fingers, but will not back up. A safe way to hold wood against a fence and not have it thrown at you by the blade. I make them often, in different sizes for different setups. I suppose I could put the sacrificial wooden fence you see on the table saw on this list, too, but I'm lazy. One of the main bad ideas of most pre-made jigs you buy is too much metal near the blades, and for some reason, too much plastic everywhere else. I don't want metal things hitting metal things. Then hitting me.This is woodworking, not the artillery. 4. 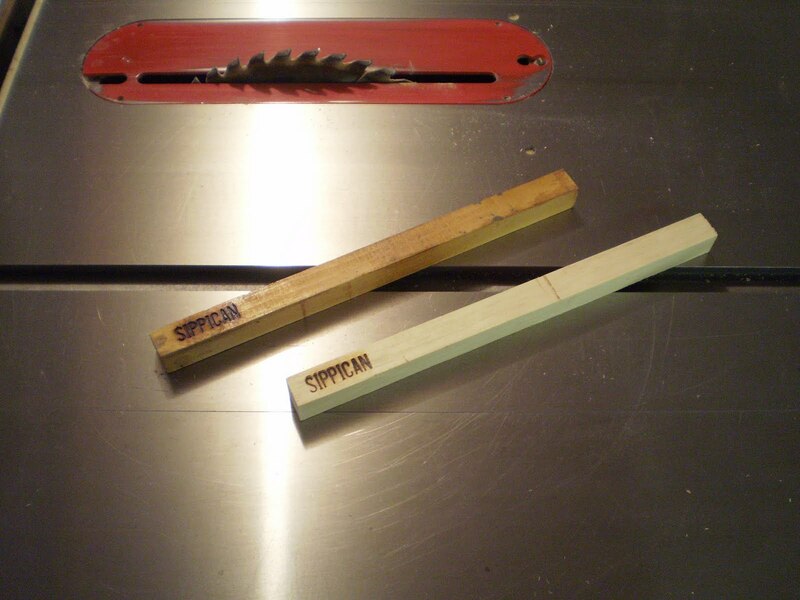 The Push Stick - All woodworkers on TV are liars. They say: the blade guard is removed so the camera can see the work. Lies. All lies. They're in the trash. Guard or no, never, NEVER put your hand between the blade and the fence. Did I mention NEVER? I push everything through the blade with a push stick. It's got a little hook in it to hold things down as well as shove them. Stuff gets thrown at you more than any other danger you'll encounter on a tablesaw. This push stick is about eight years old, I think. It's a testament to the veracity of my NEVER claim that I still have this one after all this time, despite living in two different states. It is ALWAYS on my fence, so I can NEVER. 5. 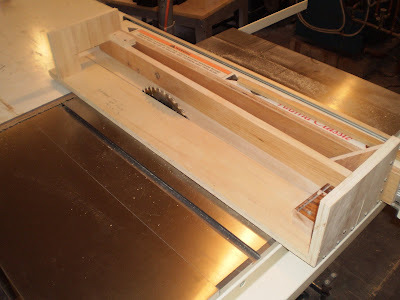 Tapering Jig - They sell adjustable ones that are made from steel for a lot of money. You must have been dropped on your head as a baby to push a steel anything through a table saw right next to the blade. Upon reflection, you were probably dropped on your head as an adult, too. I have dozens of these jigs, each made special for a particular tapered leg. They're very safe, and made from garbage. Like bacon! 6. Stop Block - It's just a leftover from a table apron or something. You clamp it to a fence and cut the same thing over and over. Measure twice, cut once! says the TV. Measure once, set the stop block, and cut 145 times, I say. Measuring twice is for dilettantes. So, there you go. I make all sorts of things with near nothing. You have near nothing, too, I suspect, or can lay your hands on it. Make something! I just learned more from this column than I ever did from Norm and his ilk, who always assume you have all his tools and know everything he does. If Necessity is the mother of invention,then I suppose experience is the father. But I learned more from my teacher back in college. He always said "Build a fixture - it may take time, but ultimately, it saves time". And he was correct. He was also a master of clamp improv - man, the way we held pieces of wood together while the glue dried was a sight to behold. I have slides. What does one do with slides these days? I spent part of a day last week sawing stickers out of dried SYP - have a lot of small boards that needed to be stacked for air drying and one can never have too many stickers. Or clamps. But today's work was more about cleaning up giant blocks of wood that have been lying around in my shop for too long - a piece of red oak I sawed earlier in the year and a piece of sycamore that a friend brought me 2 weeks ago. 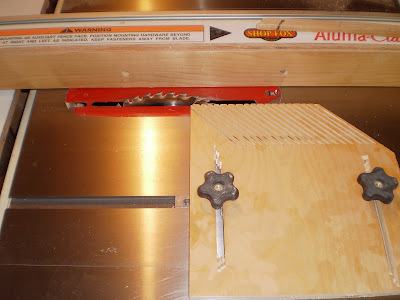 Now I can get to the pecan chunks that are almost too heavy to lift onto the band saw. I want to have the shop and storage yard cleared before the year is over - it's going to be a close thing. And I have over a dozen push sticks lying all over the shop - wherever there is a power saw there are push sticks. As a musician (well, I was once) one cannot be too careful of one's digits. I sawed a really nice push stick out of oak earlier this year - it is very curvy and ergonomic - it's my current favorite. yea that always bugged me too. measure once. cut it. if you measure twice and get different numbers what then. measuring is a skill--learn it. 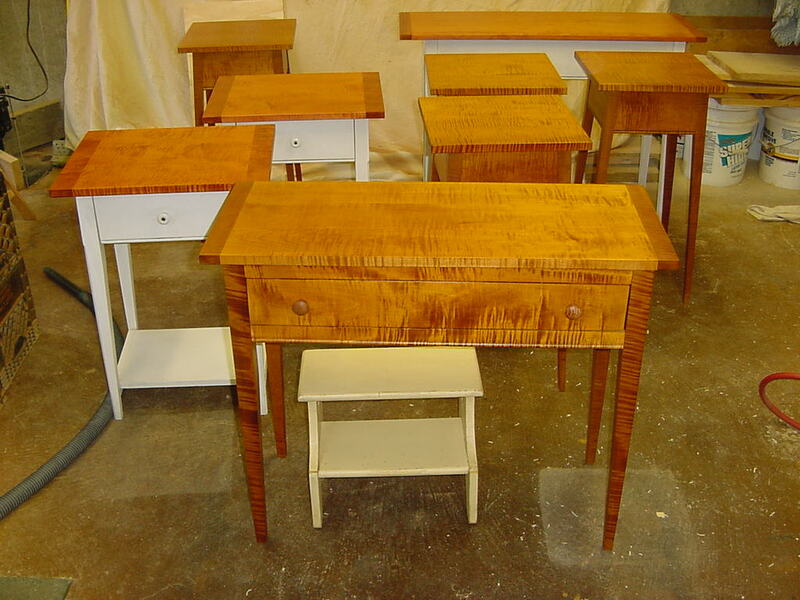 You're just teasing me with all those gorgeous tables! I made a simple sliding table using a piece of about 2‘ x 3‘ plywood, with two wood runners in the miter gage slots. The runners stick out the back far enough to pull the plywood clear of the blade, and has a 1 x 2 across the front, square with the blade. Very useful for small stuff, and guides/stops can be quickly screwed to the plywood. Popular Mechanics magazine has put its entire archive online at Google Books. 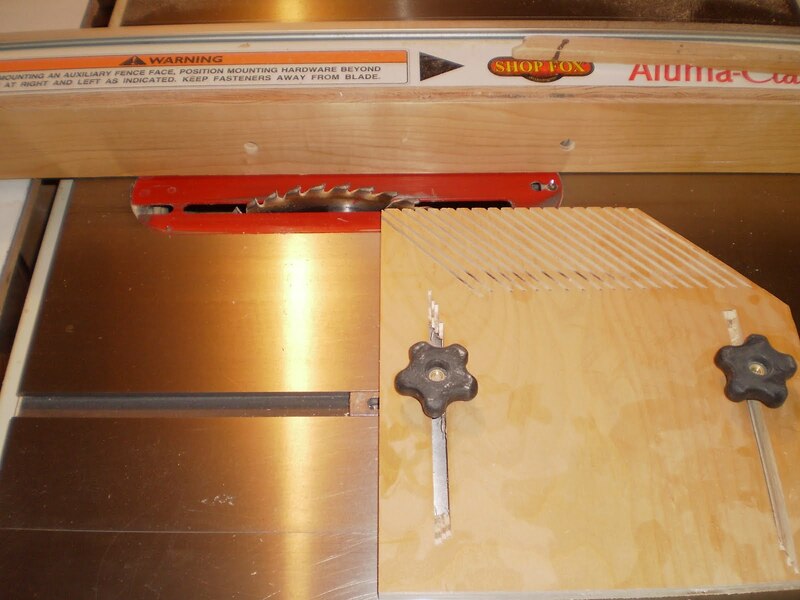 There are a lotta make-it-yourself jigs, fences, and other stuff for your table saw, drill press, etc.